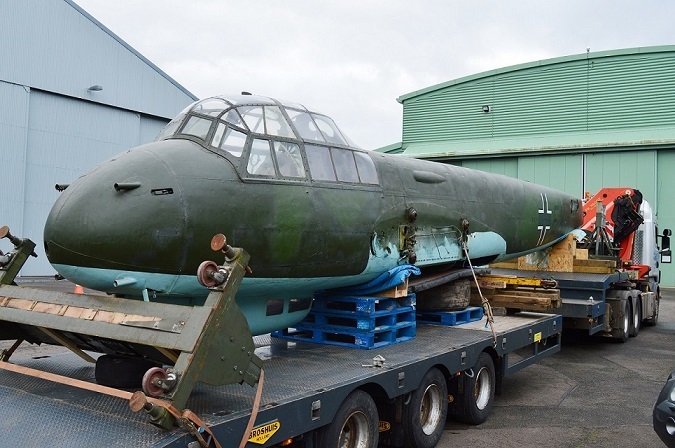 A rare example of the great German multi-role combat aircraft of the Second World War, the Junkers Ju88, has been transported by road to its new home in the Midlands. This particular aircraft, a Ju 88R-1 night-fighter version, travelled 130 miles from the Royal Air Force Museum London, to its sister site at Cosford, Shropshire where it will soon go on public display. The new arrival is the sixth aircraft to wing its way to Cosford in the last few months and completes the Museum’s new line-up in preparation for the RAF Centenary in 2018. 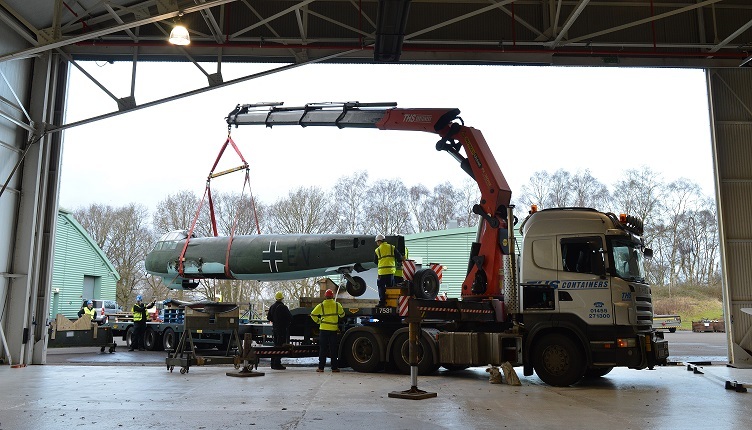 The aircraft was dismantled at the Museum’s London site and prepared for transportation by Museum Technicians and Apprentices, with assistance from GJD Services – specialist maintenance and aircraft salvage company based at Bruntingthorpe, Leicestershire. 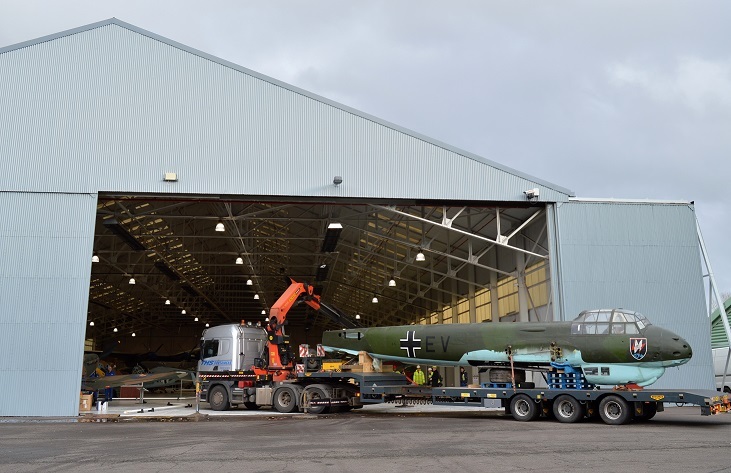 The fuselage and port wing have now been transported to Cosford, with the starboard wing due to arrive next week when work will commence on the re-build. 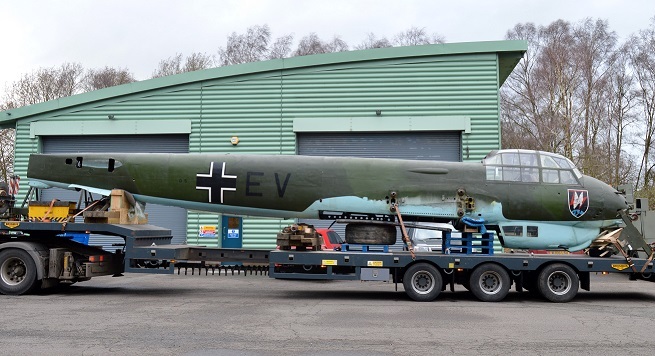 This latest arrival is a huge coup for aviation fans in the Midlands, giving them access to one of the most versatile German combat aircraft of the Second World War and one of the Luftwaffe’s most important assets. The Ju88 began life as a bomber, became a night fighter and intruder; undertook anti-shipping operations and flew long-range reconnaissance missions. They entered service in September 1939 and by the end of the month they were undertaking their first operational mission against British shipping in the Firth of Forth, Scotland. It was during the Battle of Britain, however, that the Ju88A played a major role in German operations. Ju88’s took part in a number of daylight actions against British radar stations, airfields and ports in the opening phases of the Battle of Britain. It was reasonably manoeuvrable for its size and could take a great deal of punishment; however its lack of armoured protection and insufficient defensive armament meant that it was relatively easy prey for British fighters. At the time of the Battle of Britain the Ju88 was at the beginning of its service career and its remarkable adaptability, particularly as a night fighter, had still to be exploited by the Luftwaffe. The museum’s example was constructed as a Ju88 A-1 bomber in 1942 and converted to the R-1 standard in early 1943 for the night fighter role. In May 1943 a three man crew were ordered to intercept and shoot down an unarmed BOAC Mosquito courier flight from Leuchars, Scotland to Stockholm, Sweden. Just two hours after take-off, the pro-British and anti-Nazi crew sent a bogus message to Night Fighter HQ reporting a starboard engine fire. The Ju88 descended to sea level, below German radar and dropped three life rafts to make the Germans think the plane and crew were lost at sea and then headed for Scotland. The Ju88 was eventually intercepted by two Spitfire VBs from No.165 (Ceylon) Squadron RAF. Identified as a Ju88, when approached the German pilot dropped his undercarriage and waggled his wings and was then lead back to Dyce airfield where all three aircraft landed safely. The Spitfire pilots were later congratulated for not opening fire and bringing home valuable information for the technical branch. This was a significant coup for the British - the Ju88 was fitted with the latest FuG 202 Liechtenstein BC A.I radar. It was the first of its type to fall into British hands and was quickly placed inside a hangar to hide it from Luftwaffe reconnaissance aircraft. Shortly after, it was allocated the British serial number PJ876 and commenced a test programme with RAE Wireless and Electrical Flight, in conjunction with the RAF’s Fighter Interception Unit, whose role was to evaluate captured enemy aircraft and demonstrate their characteristics to other Allied units. The aircraft was acquired by the RAF Museum in 1978 and has been displayed at its London site for almost four decades and will now go on display at Cosford for the first time in the Museum’s ‘War in the Air’ hangar. "We are delighted to add the Ju 88R-1 to our collection of Axis aircraft types on public display at Cosford. The Junkers Ju 88 was one of the most versatile military aircraft of all time and this particular example, the last surviving night fighter variant, has a truly fascinating story to tell. 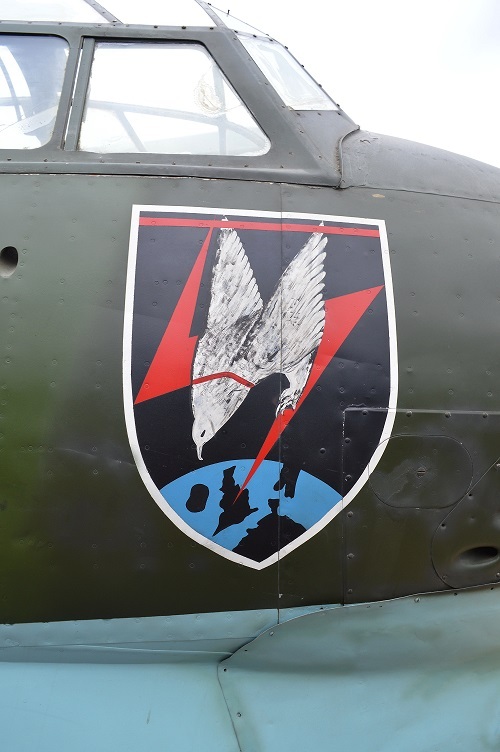 It will be displayed alongside other significant German aircraft of the period and will enhance the Museum’s ability to tell the wider story of RAF operations during the Second World War." Within the last few months a total of six new aircraft have been transported by road from the museum’s sister site in London for display at Cosford. The first to arrive was the Messerschmitt BF109G-2 which is now displayed in the ‘War in the Air hangar’ confronting its British equivalents, a Hurricane and Spitfire. Transported alongside the Bf109 was the de Havilland Tiger Moth II which can now be viewed in ‘Hangar 1’ alongside the Scottish Aviation Bulldog T Mk 1, demonstrating the progression in RAF training aircraft. Just a few short weeks later the Wolverhampton built Boulton Paul Defiant M1 made a homecoming journey along the M1 and M6 to the museums Cosford site, just a few miles from where it was built in the late 1930s. Accompanied en route by the Gloster Gladiator 1 and the Westland Lysander III, both the Defiant and Gladiator will be reassembled once the Ju88 is in position and go on display in the ‘War in the Air’ hangar, whilst the Lysander will undergo some minor repair work to its fragile linen skin in the museum’s Conservation Centre. The aircraft moves come as the museum prepares for the Royal Air Force’s centenary celebrations in 2018 that will see the museum transform its London site with a series of new permanent exhibitions opening in the summer of 2018. The multi-million pound development programme will see investments in new exhibitions, improved education and volunteering opportunities, and landscaping that will emphasise the site’s importance as a heritage airfield. It will improve the visitor experience, extend the Museum’s reach to new audiences and create a lasting legacy to mark the Centenary. The enhanced aircraft collection at Cosford will enable the RAF’s story to be more comprehensively represented to museum audiences in the Midlands. In addition, plans for 2018 will include displays exploring the first 100 years of the RAF, the role it plays today and its future contributions. Making the RAF story available to a global audience there will be a huge investment in the Museum’s online offer. Aviation fans can keep up to date with the centenary aircraft moves and on-going developments by signing up to the museum’s free e-Newsletter. Entrance to the museum is free of charge and the museum is open daily from 10am until 4pm.